They’re baaack! 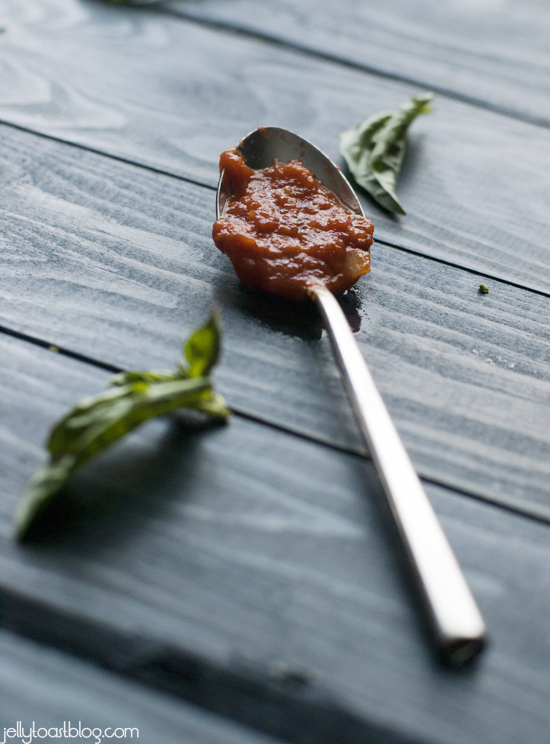 I have a few more slow roasted winter tomato recipes up my sleeve (or rather in my posting queue) and I thought I would share a quick and easy, but utterly delicious Slow Roasted Marinara Sauce. Seriously, if you whip up a batch of this, you will feel completely productive with minimal effort; plus your kitchen will smell like an Italian Restaurant. If you’re in to that kind of thing. Which I totally am. To make this slow roasted marinara sauce, I used some of my insanely tasty slow-roasted winter tomatoes plus a can of my favorite San Marzano tomatoes in puree. Some onion, garlic, a few herbs and even a bit of red wine give this sauce endless layers of flavor. Pour it over pasta, dip a bread stick in it or just eat it with a spoon; it doesn’t matter. This is some seriously awesome sauce. I just had to work that in there. Please forgive me. In a large saucepan or dutch oven, heat olive oil over medium heat. Sautéed onions and garlic about 5 minutes or until soft and beginning to caramelize. Add tomatoes, purée and roasted tomatoes; stirring and breaking up with a wooden spoon. Bring to a simmer and allow to cook for about 5 minutes. Stir in oregano, basil, salt, pepper and wine. Lower heat and simmer for 15 minutes or until sauce is slightly reduced. Blend with an immersion blender to achieve the desired consistency. I like a chunky-ish sauce, so left mine with a bit of chunk in it. 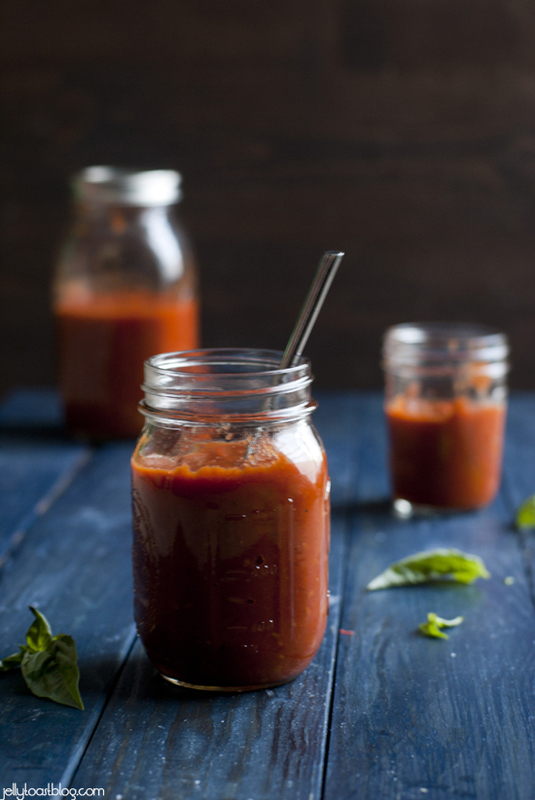 Sauce can be kept in air tight containers in the refrigerator for up to 4 days. 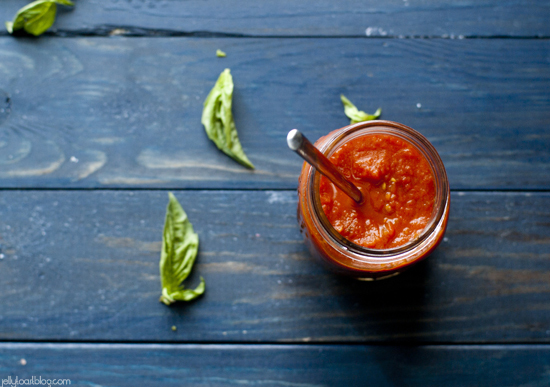 I love making tomato sauce at home, it’s such a satisfying process and a warm, comforting meal. Lovely photos! I couldn’t agree more, Jessica! Thanks for stopping by! I don’t have access to fresh basil, can I use dry? If so how much would you recommend?